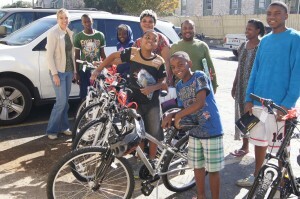 A private couple in Austin, Texas sponsored a family, who left war torn Congo, to get new bikes for the children. Larry Jolly and family worked with Bikes for Goodness Sake to raise money and deliver them in time for Christmas. As you can see, the faces are delighted. Good job to Larry and his wife, those who donated through Bikes for Goodness Sake, and Bucks Bikes and their mechanics who built the bikes on short notices. It was a Merry Christmas by all. Learn more about bikes for Congo refugees and other charity bike build that you can sponsor.